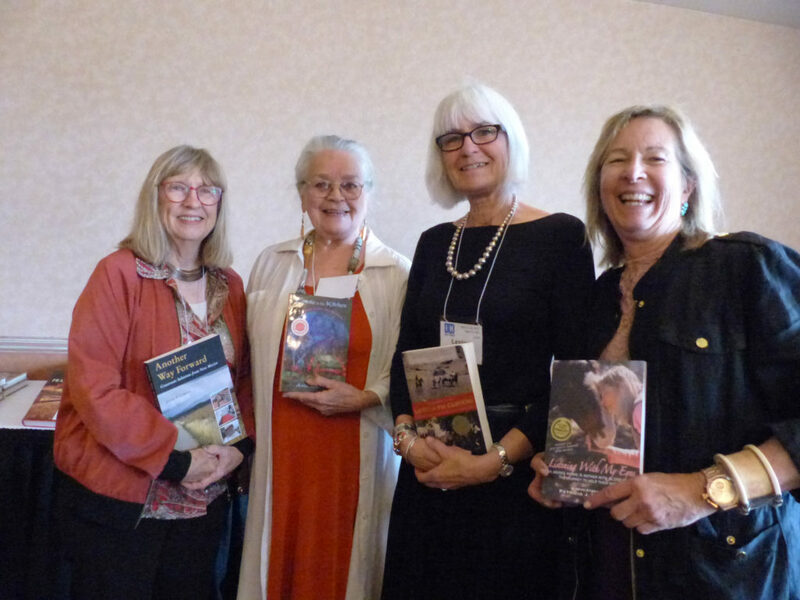 One of the highlights of the 2018 New Mexico Press Women Annual Conference in Santa Fe this year was listening to the Zia Award finalists speak about their books. 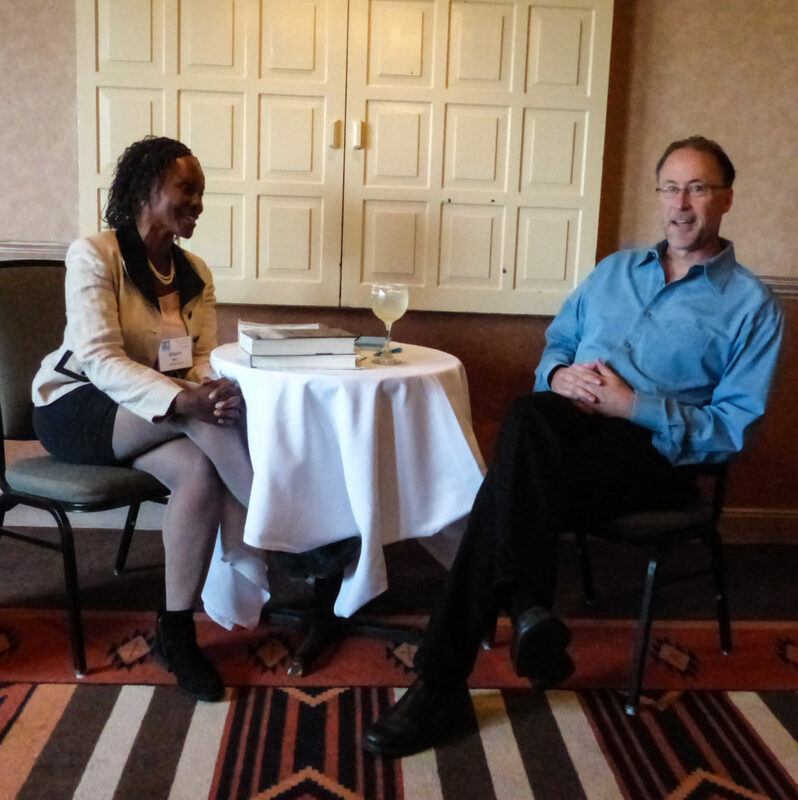 This year the category was non-fiction and Contest Organizer Bill Diven said the judges were very impressed with the quality and variety of the books submitted. A Ranchos de Taos author whose culturally divergent family melded around recipes is the winner of the New Mexico Press Women Zia Book Award. 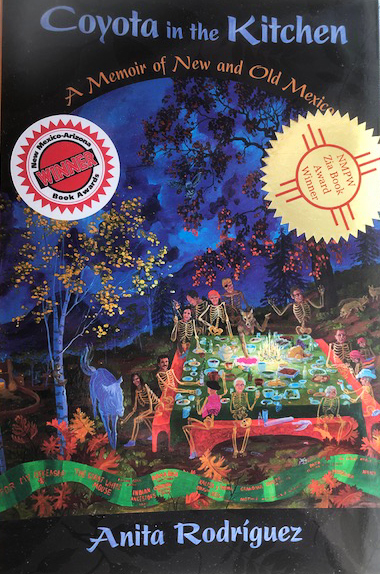 Anita Rodriguez accepted the award for her Coyota in the Kitchen: A Memoir of New and Old Mexico during the annual conference at the The Lodge in Santa Fe. The book is published by the University of New Mexico Press. Rodriguez also produced the art used on the cover and throughout the book. She took up painting after 25 years with her own company applying applying traditional adobe and masonry techniques to construction and building restorations. Her tale of cultural collision springs from the unlikely marriage of her father, a dirt-poor northern New Mexican, and her mother, a Southern aristocrat. The culinary merging led to such creations as creme de menthe with yerbabuena, she added. Three other finalists were also honored at the conference for the 2018 Zia Book Award. Patricia J. Conoway of Cerrillos, for Listening with My Eyes: An Abused Horse. A Mother with Alzheimer’s. The Journey to Help Them Both, a self-published book. Dede Feldman of Albuquerque for Another Way Forward: Grassroots Solutions from New Mexico, published by Dede Feldman Co.
Lesley Poling-Kempes of Abiquiu for Ladies of the Canyons: A League of Extraordinary Women and their Adventures in the American Southwest published by University of Arizona Press. The Zia Book Award is given annually to women authors living in or with a strong connection to New Mexico. The competition rotates among nonfiction, fiction and children’s books published during the previous three years. A highlight of the conference was a Friday evening event billed as a conversation between NMPW incoming president and author Sherri Burr and Hampton Sides, author of Blood and Thunder, Ghost Soldiers, Hellhound on his Trail, In the Kingdom of Ice: The Grand and Terrible Voyage of the USS Jeannette, Americana: Dispatches from the New Frontier and On Desperate Ground: The Marines at the Reservoir, the Korean War’s Greatest Battle. Their discussion revolved around techniques for approaching a complex non-fiction story and how to break it into easy-to-handle pieces, as well as finding stories that need to be told. Sides and Burr also discussed how and where to write, and how to research when information is scattered. A morning keynote with Sara Solovich, the editor of Searchlight New Mexico explored a new path for journalists who want to work on longer investigative pieces. Searchlight New Mexico chooses a major subject each year and working in cooperation with newspapers and KOAT, the ABC affiliated television station in Albuquerque produces pieces about that subject throughout the year. Searchlight this year is focused on stories about early childhood in New Mexico. A Saturday morning panel discussion on creating narratives featured Cindy Nava, a DACA recipient and national motivational speaker who writes for the Huffington Post; Karen Jones Meadows, a nationally known playwright whose play Harriet’s Return: Based Upon the Legendary Life of Harriet Tubman has been performed throughout the world; and Lorene Mills, the host of New Mexico PBS Tv’s longest running public affairs program Report from Santa Fe, showed the enriching perspective of cultural narrative. A talk by Simon Romero, Southwest Bureau Chief for the New York Times brought a disturbing perspective to current effects. Romero has recently returned to New Mexico, where he grew up, from postings as a foreign correspondent covering Brazil, Argentina, Chile, Paraguay and Uruguay. His intelligent dissection of the rise of autocrats in South America and the mechanisms they used to control and direct public discussion had eerie parallels to current events in the United States. The conference was thought provoking and interesting. Please consider joining New Mexico Press Women in 2019 for the annual conference, which will be in Albuquerque in late April.